Vital Dental Hygiene Clinic makes it clear with their motto (caring for you & your smile) that patient satisfaction with their smile makeover procedures is on the top of the to-do list. Based in Alberta, Vital Dental provides different dental services that will have you smiling from inch-to-inch. 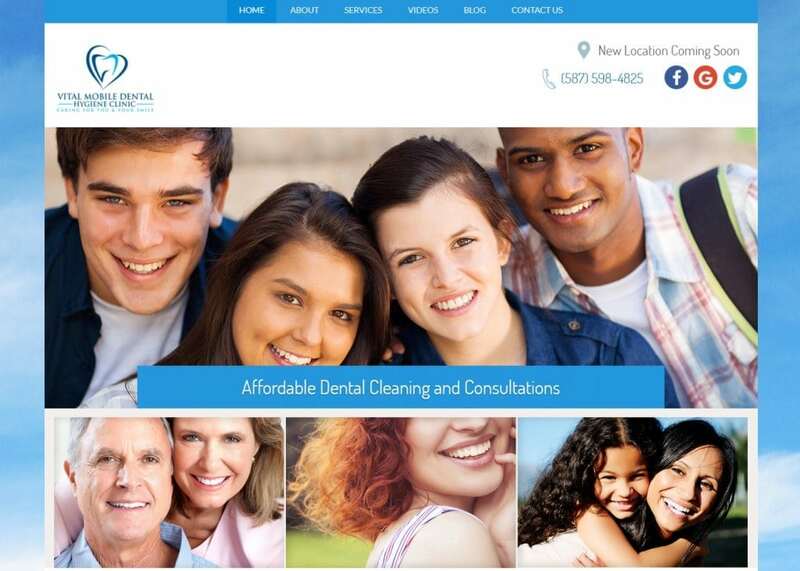 We designed a modernized website that would showcase the team’s hospitality and diversity in the dental industry. To match their mission statement, we went with a modernized website design. When first-time web visitors enter the website, they will immediately be captured by the alternating image gallery that radiates over the home page. Not only does this create a beautiful aesthetic, but also helps readers zone in on the different services and procedures offered at the dentistry. Heading down the home page, there is a short but simple mission statement and an appointment-maker. The home page is all about using crisp, modern images that help convey a sense of helpfulness and optimism. There are also several video visuals incorporated throughout the site as well. Some of which even features the Vital Dental team themselves. This is a great way to establish a start to the patient-doctor relationship before even stepping in the building. When you present your staff to be personable and compassionate, you create a sense of hope and safety with the patient that can often last a lifetime. We went with a simple blue and white color theme when designing the website. The white background allows for optimal reading and allows the blue to truly pop out at the users as well. When set amidst a wave of white, blue jumps out at the viewer without being too assertive or flashy. It is primarily used to highlight calls to action. When combined together, blue and white make for a dynamic team. When you combine an effective color palette with the design layout, you help add credibility and a touch of modernism to your website. Vital Dental offers several unique services that are not generally found at other dental offices. Sealants and mouthguards are two prime examples. When you offer a specialty or niche to your product, you have a great client base to work with. We made sure all the services were featured on the navigation menu on the top of the web page. Space is expertly managed throughout the website. The ample amount of white background along the text helps the patients navigate through the site with ease. Navigating through this website is always a breeze. The navigation menu is always accessible and is home to any and all sources of information you may be looking for. All the design elements are comprehensive and flow well together in unison. Vital Dental understands that they have a special niche in the dental industry. We made sure to highlight these with the images and videos on the website. Accessibility and convenience are two of the most important aspects that incoming patients look out for. Dental Vital offers new-patient forms on its website under the forms tab. To top it all off, the website is hack-free thanks to SSL Security. SSL Security protects important patient information by encrypting the information before sending it off to the database.